PA KHLOK, PHUKET: A 47-year-old Muslim man with no education past high school has won top honors for Phuket in a nationwide search for the most outstanding citizen in each Thai province. 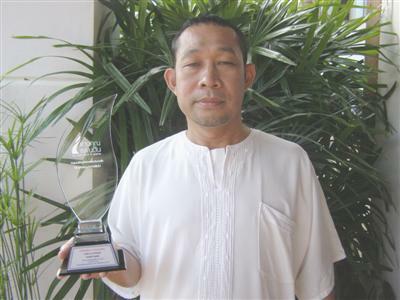 Jeerasak Torthip was named an ‘Outstanding Citizen’ for his work in securing a simple, sustainable way of life for the people of Bang Rong Village, a coastal community of about 1,000 Muslims in tambon Pa Khlok. Mr Jeerasak was awarded the honor through a project called Thaen Khun Paen Din (‘Showing Gratitude to the Country’) 2552, run by The Nation Group together with the Social Development and Human Security Ministry. He was credited for his devotion over the past decade to restoring and protecting the natural environment in Bang Rong and ensuring the community sticks to a traditional, Islamic way of life. Mr Jeerasak said he encourages his neighbors to resist the temptations of materialism, stressing the importance of mangrove forests to their way of life. Materialism destroyed this traditional lifestyle, he said. “Villagers sold their land to property developers in exchange for money to buy cars and live lavishly,” he said. When the mangrove forests started being destroyed it became harder and harder for villagers to make a living, he said. “Then we became aware of the mangrove’s importance and realized it was time to start recovering these treasures and our old way of life,” he said. He uses his position as a leader at Bang Rong Mosque to instill the community with Islam-based beliefs about conserving nature. In 2002, Mr Jeerasak and other mosque leaders created a project called ‘Bang Rong Agrotourism’. The project is based at Bang Rong pier, which is surrounded by over 2,000 rai of mangrove forest. Tourists can hire canoes and boats to explore the forests, take a bicycle tour of the village or go trekking. “We use tourism activities as a tool to manage community resources on both land and in the sea, through a process of informal learning,” he said. Around 50 tourists visit the Bang Rong mangroves every day, he said. Fish raised in floating baskets in the mangrove forests are caught by local fisherman then sold to tourists at the Krua Chumchon Bang Rong (Bang Rong Community Kitchen) restaurant. “All the guides for tourism activities are people from the community. Everything runs in a cycle,” he said. Mr Jeerasak’s community projects don’t stop at agrotourism, however. The mosque committee started a savings fund with 30 villagers back in 1997. The fund now has more than 700 members with almost 30 million baht in savings, Mr Jeerasak said. “With this fund, we’ve bought back many plots of land from investors and given scholarships to poor but smart students so they can get a university education,” he said. Mr Jeersak talked of his feelings on receiving the ‘Outstanding Citizen’ honor. He would put his award on public view at Bang Rong Mosque, he said. “Because without the contribution of Bang Rong residents, we could never have won this honor,” he said.